More than a year since it began, companies both large and small continue to feel the impact of the #MeToo movement. Beyond auditing policies and sexual harassment training, the conversation has expanded to include pay equity. Companies, particularly those that are publicly traded, are facing pressure to disclose detailed information about gender pay differences. One such way this disclosure is being forced is various shareholder actions. Activist shareholder investor groups are threatening shareholder resolutions to force companies to release a simple comparison of the median incomes of all of its male and female employees without any context of the usual non-discriminatory factors such as job title, seniority and education. Most notable is Arjuna Capital pressuring Citicorp with the threat of a shareholder resolution to disclose a recent assessment of pay information. 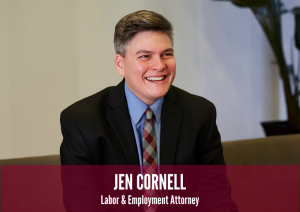 “Many companies are not opposed to releasing such information,” comments Jen Cornell, an attorney with Nilan Johnson Lewis who advises employers on pay equity practices. “However, they face a risk doing so under the gun and without sufficient time to analyze the findings and address any red flags.” Similarly, there has been the use of shareholder derivative actions to file gender discrimination lawsuits, such as those that have been filed recently against Alphabet, CBS and Wynn Resorts. “To get out ahead of these lawsuits and shareholder actions, we advise employers to conduct pay equity audits and continue to train on and review sexual harassment policies,” recommends Cornell. To speak with Jen Cornell about pay equity analysis as well as gender discrimination compliance, contact her at 510.671.8327 or jcornell@nilanjohnson.com.